Sigh. It is with a heavy heart that I type this evening, as the dreaded circled date on the calendar, which I’ve been trying to ignore, is nigh; the last day of my maternity leave. The return to my day job looms large and, like most new mums, I’d quite happily stay in this lovely bubble of sitting in my PJs, eating cake and playing with the little’un, until he’s 18. Sadly, the bank manager seems to have a different opinion, so I’m re-joining the world of work (office based work that is, not Rockpool work – that’s 365 days a year, and definitely not a chore!) and my little pal is off to have wonderful times with his Grannies. Humph. 1. Giving birth in Derriford Hospital, Plymouth. OK, it was painful, and long, and exhasting and messy. But still overwealmingly brilliant. 3. A lovely lunch at Charlies Coffee House in Charlstown, just outside St Austell. This place has cake TO DIE FOR. And when you’ve had no sleep and are feeding round the clock, wedges of cake the size of iron doorstops are not only appreciated, but necessary. Lovely place, lovely people. 4. Little’un’s first beach experience – a rather chilly walk along Port Wrinkle beach in South East Cornwall. (Obviously he didn’t walk – we did. He got carried in a rather snuggly sling). The beach is defintely going to become a big part of his life in the years to come, but unfortuantely he mostly slept through this first trip, being only 8 weeks old. Honestly. 5. A bit of tennis fever in June when we joined some mummy and baby friends to watch Wimbledon on the big screen in Plymouth City Centre. Gorgeous day, gorgeous friends, gorgeous city. 7. Enjoying the sunshine and giving mini-RT a taste of some fresh water swimming, at Plymouth Tinside Lido. A truely stunning view – can’t recommend this enough. (In summer. Wouldn’t recommend it in winter…). 8. A visit to the National Marine Aquarium in Plymouth – littl’un loved the fishes and seemed completely oblivious to the sharks. What it is to be young and fearless. 9. A day trip to Mount Edgcumbe, East Cornwall for a picnic and walk along the beach with the extended RT family. Bloomin’ freezing, but lovely nonetheless, and fab views back across the Tamar to Plymouth. I was taken there lots when I was a kid, so it was lovely to keep the tradition going. 10. And so we’re up to date: last Friday afternoon, when the whole RT team went for a scrummy lunch at Ruby Burgers in Exeter. 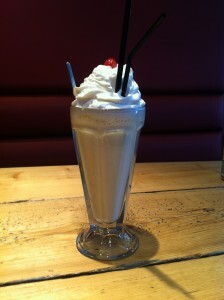 An ultra-cool diner experience, with monster milkshakes (see pic) and beautiful burgers. Mini-RT is now big enough to sit in a highchair, grab all the cutlery and throw it on the floor, but no one seemed to mind. We love. Hey ho – I guess nothing lasts forever and so we’re on to the next phase. We’ll just have to save those wicked Westcountry days for the weekends. First of all, apologies for a slightly tardy blog entry this week. Last night during the usual post mini-RT bedtime / pre-Strictly results blog slot, I was flaked on the sofa after travelling to and from Hampshire in one day to pick up a third hand Punto. Anything I would have written would have been ramblings about needing rest and / or chocolate and / or a head massage. Anyway, it wasn’t just the Sunday jaunt up the M5 which floored me; on Saturday Rockpool started its Christmas craft fair campaign at the “Crikey! It’s Vintage” fair at the Thistle Hotel in Exeter. It was a veritable vintage extravaganza with more than victory rolls, full skirts and red lipstick than you could shake a stick at. 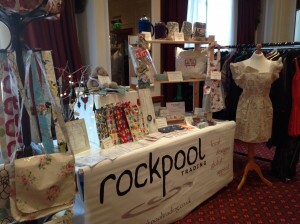 The whole event was a roaring success and was a blast for customers and stallholders alike. On the RT front, we kicked off the Christmas season in style, and had a whale of a time nattering to customers as well as helping some particularly well organised folk start their Xmas shopping. (Always happy to help). One thing which always surprises me when we take RT on the road is the number of people who ask me “Ooooh, did you make all this yourself?”. Now, bear in mind that on the RT stall we have ceramics, jewellery, glassware, appliqué cushions, oilcloth handbags, crotched cafetierre cosies and wooden Christmas tree decorations, to name but a few. Even after hunting the South West for the best suppliers for the site, I’ve yet to meet the talented individual who could cover all of these disciplines, especially to a standard good enough to be let lose on the public…! Hey ho – one day I might find this super-crafter, proficient in everything from weaving to whittling, and when I do I’ll be sure to blog about them. Before I started up RT, I attended a free local “Introduction to Business” type course, and learned the sales mantra – people buy from people. (My husband who had worked in sales all his life apparently already knew this, but as someone who was new to the sales world, this phrase stuck with me). If this is indeed the case, the numpty who cold-called me this week to try to get me interested in making money through the Government’s new green energy scheme, but who somehow lost his way and ended up insulting me and then hanging up, would need a personality transplant if he hoped to meet his targets. I was minding my own business on Thursday morning, getting on with my day with tiny-RT, when the phone goes. The thought briefly flitted through my mind – “no good can come from answering the landline during the day” but I never could resist a ringing telephone, so I answered. He immediately leapt into his diatribe about the scheme, barely pausing for breath even after his opening line of “Good morning, how are you today?”; therefore I was unable to interject and let him know I was not now, nor would I ever be, interested in any offer a stranger makes to me completely out of the blue on the phone, until a good 60 seconds after the phone call started. Eventually, the time did come when he decided to include me in the conversation (“this IS something you’d be interested in doing isn’t it? !”), at which point I thanked him but said I wasn’t interested. (Mini-RT was getting grizzly and I was missing Homes Under the Hammer). However, rather than accepting this, he asked incredulously “you’re not interested in getting free electricity???”. His tone immediately got my back up; it was right up there with the charity muggers who accost you on the street and say “have you got 2 minutes to spare for the children / animals / rainforests?” – the insinuation being that if for any reason you don’t, you’re a heartless human being with no soul, regardless of any existing charity involvement you may have. But anyway, he was affronted by my apparent rejection of a freebie, so I responded (still politely), “no thank you, I’m not interested and I don’t have to justify to you why I’m not interested”. To which he responded with… “Well, you’re not very bright then are you?”. And hung up. Needless to say what followed from my end (after 10 seconds of staring at the receiver, mouth open) was a swift phone call back to the company (thank you 1471) with a few choice words which left the manager in no doubt of my feelings on the call I’d just received. The manager (who I’m not convinced wasn’t the same gentleman who’d called me in the first place but anyway) said he would investigate and call me back within 24 hours to let me know the outcome. Predictably, I’ve not heard anything further, but that’s by the by. The reason I bring it up is it made me think about the whole sales culture. As I’ve mentioned, by hubby has worked in sales his whole life, but when we met, I was surprised as he doesn’t come across as pushy / aggressive / smarmy or any of the other adjectives I previously linked to the sales industry. Yet he’s successful in his job and made me see that you can be involved in sales and not be a complete… pain. So when we started RT, I was conscious to be as gentle and sensitive as I could be when it came to the dreaded world of “selling”. This isn’t to say I don’t want to shout from the rooftops about our products or our sellers or the South West in general, but there is a big difference in giving people all the information they need and leaving them to make their decision at their own pace, and beating them into submission with sales patter. So thank you Mr Hard-Sell. You’ve reminded me, before we embark on the season of Christmas fairs which we start next week in Exeter, of the importance of responsible selling. We can’t wait to meet lots of customers at all the upcoming fairs, but we’ll never be pushy. Or rude. Or call you thick. See? I said I’d be back next Sunday! It’s been a fairly quiet week this week, but I sense a Christmas-shaped manic phase on the horizon, so I guess I should enjoy the calm before the tinsle-wearing, carol-singing storm. We’ve added a scrummy new line to the RT shelves this week – some rather funky children’s coin purses by the equally rather funky Hootchie Mama based in Hayle (West Cornwall, for those of you from further afield). I’m already a huge fan of the Hootchie Mama stuff, and we’ve been stocking their crayon bags for over a year (they sold fantastically at the Christmas fairs last year), so I think these will be another winner. I’ve been a bit deflated at how long it’s taken us to add new product lines to the website this year – when we started up we had around half a dozen product lines, and in the last 2 years we’ve added several more, however 2013 has only seen a handful of new items hitting our shelves. This is in no small part down to the new addition to our family, who seems oblivious to my Rockpool empire masterplan and insists on needing attention pretty much 24/7. This, coupled with the length of time it takes to research products to make sure we get the best of the best from the West (catchy eh? ), start a dialogue, agree terms and actually get the items onto the cyber shelves has meant we’ve tended to stick with existing stockists this year. Not that expanding the ranges we stock from the 14 designer-makers we already support is a bad thing – we love them and their fabulous work – it would just be nice to add to the RT clan. Still – we’ve noticed over the last year that new crafters are approaching us with their products, which is wonderful, not only because it saves us time sniffing them out, but also it’s nice to see that people value what we do and want to be associated with us. Hooray! Everyone’s a winner. So fingers crossed 2014 will bring many more humongously talented Westcountry crafters into the RT fold. Come on in me ‘andsomes – the water’s lovely.